No matter where you stand politically, we all owe veterans a debt that can never be fully repaid. These are people who agree to lay down their lives to defend our country and values. Yet veterans returning from Iraq and Afghanistan are facing a large scale employment crisis that is leaving many of them without a means of supporting themselves. The crisis stems in part from stereotypes about members of the military. Employers hesitate to hire veterans because they’re afraid of dealing with individuals who they think might have PTSD, brain injuries or other hidden disabilities. In reality, the numbers surrounding these kinds of cases are small, and are fairly easy to manage. Nancy B. Adams, the branch chief at the U.S. Army Warrior Transition Command told Fortune.com that most traumas can be addressed through simple steps and the average cost of accommodating an injured veteran is only $500. Among other reasons, veterans are excellent job candidates because they have a great work ethic and understand the importance of teamwork and safety. 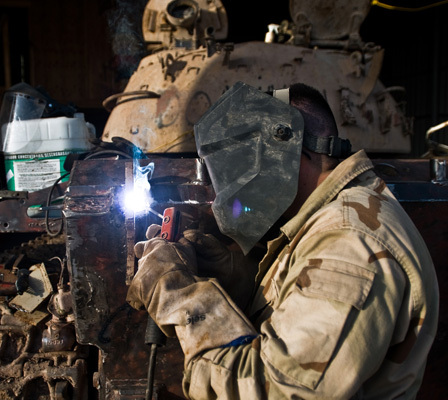 Some, like this US Army soldier welding a tank in Iraq, have valuable welding experience. Employers are also concerned that former soldiers will be too rigid and have difficulty thinking outside the box, when the truth is that military training is specifically tailored to encourage thinking creatively in addition to obeying the chain of command. Government agencies and private institutions are working hard to alleviate the effects of these negative stereotypes. For example, members of the manufacturing industry are taking steps to help veterans find work. “It’s time for businesses to commit to helping veterans establish successful, rewarding careers” Marillyn Hewson, Lockheed Martin CEO, wrote last year as part of a call to industry leaders to see the value of veterans. In 2012, Lockheed Martin joined GE, the Manufacturing Institute, Alcoa and Boeing on a collaborative program called Get Skills to Work. The program’s mission is to join major manufacturers and educators to train U.S. veterans to fill the hundreds of thousands of open jobs in advanced manufacturing. These programs are part of a growing wave of workforce support designed to help veterans, and we at American Welding Online are likewise committed to raising awareness about veteran unemployment and the efforts that the welding industry is making to help get veterans back in the workforce. Consequently, our next blog post will look into the veteran education program at the Hobart Institute of Welding Technology. After that we’ll be hearing from Ernesto Gomez, a veteran of the U.S. Army who participated in the UAW-Ford Welding Training program for veterans. He’ll be sharing his experiences with the program and the unexpected opportunities he found in a welding career. Finally, we’ll cap off our veterans’ series of posts by spotlighting Wounded Warriors Family Support, the organization that works with UAW-Ford to provide veterans with its welding program. So join us in showing support for veterans and raising awareness of veteran unemployment as AWO thanks our service men and women for their invaluable service. As always, we invite you to visit our website at http://awo.aws.org, where you can find online courses, virtual conferences and other digital tools to help you advance your own career within the welding industry.